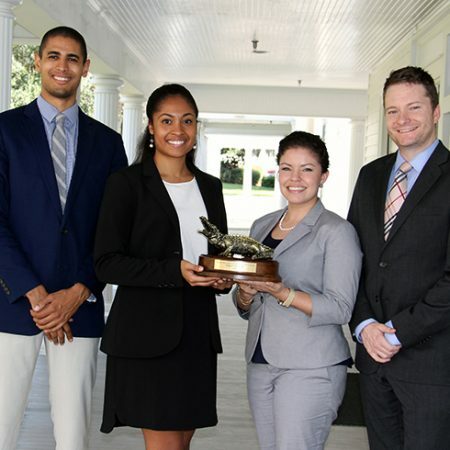 The Florida State University College of Law Mock Trial Team has won first place in the National Trial Advocacy Tournament sponsored by the University of Florida. The competition, which was held Oct. 9-11 in Gainesville, involved a criminal trial. A total of 13 teams participated in the tournament, including a team from the University of California – Los Angeles School of Law, which Florida State beat in the final round of competition. Other schools competing included Fordham University School of Law, The University of Alabama School of Law, University of Georgia School of Law and University of Richmond School of Law. Winning team members are second-year students Lauryn Collier, from Charlotte, North Carolina, Lolia Y. Fernandez, from Pembroke Pines, Charles LeCocq, from Las Cruces, New Mexico, and Rico Lively, from Naples. College of Law alumnus Adrian Mood (’13), who is an assistant state attorney in Tallahassee, and Patrick Kinni, who practices with the Leon County Attorney’s Office in Tallahassee, coached the team to victory.